What is Vitamin D and How Does It Work? Many people don’t have enough vitamin D, and are unaware of its many benefits. Scientists are discovering new possible roles for this important nutrient almost daily. If you think you have enough vitamin D in your body, you may be in for a surprise. A vitamin is defined as an essential nutrient that a living being must acquire in tiny amounts from the diet. A vitamin is a chemical that’s essential for your body but that your body can’t make; it must be ingested. By this definition, vitamin D isn’t a vitamin at all. Consider this — your skin can make vitamin D when it’s exposed to sunlight, so your body doesn’t have to acquire it from food. If vitamin D isn’t really a vitamin, what is it? It becomes a hormone called calcitriol (active vitamin D) after your body metabolizes it. A hormone is a chemical in your body that regulates your physiology. Both forms of vitamin D are created when the ultraviolet rays of the sun act upon a form of cholesterol. In certain plants, the ultraviolet rays convert a molecule called ergosterol into vitamin D2. In humans, vitamin D starts as a substance in the skin called 7-dehydrocholesterol. 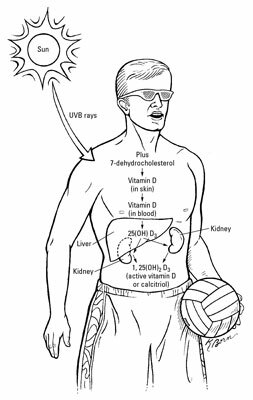 The ultraviolet B (UVB) rays from the sun convert 7-dehydrocholesterol into vitamin D3. However, neither vitamin D nor vitamin D3 are active yet. In fact, vitamin D does nothing by itself; it’s completely inactive, and that may make you wonder what all the fuss is about. But it’s what vitamin D turns into that becomes important. Vitamin D travels through the bloodstream to the liver, where it’s turned into 25-hydroxycholecalciferol (25(OH)D or calcidiol). This is a prohormone or precursor for the vitamin D hormone. The vitamin D prohormone travels through the bloodstream to the kidneys, where it’s turned into the active form, 1,25-dihydroxycholecalciferol (1,25(OH)2 D3 or calcitriol). 1,25(OH)2 D3 is the active vitamin D hormone. It is released back into the bloodstream where it then regulates how your body uses calcium and phosphorus. The following figure shows the conversion process in the body. Some controversy has arisen over whether vitamin D2 is as active as vitamin D3 when it’s ingested, but the consensus is that D3 is two or three times as potent in raising the level of 25-hydroxycholecalciferol. How the body creates vitamin D.
Because the liver and the kidneys are involved in the production of calcitriol, diseases of these organs may affect your ability to make this hormone. The best understood role for calcitriol is in the control of how your body uses calcium and phosphorus to make strong bones. However, research is showing that many organs and systems in your body may also need active vitamin D. The intestine and bones rely on the kidneys to make and ship calcitriol to them. Other organs may be able to make small amounts of calcitriol on their own. Active vitamin D works by entering cells and attaching to a protein called the vitamin D receptor, located in the nucleus of cells, where the genetic material is located. This combination of calcitriol and its receptor stimulates the cell to make proteins that regulate the way the body works. For example, some of the proteins produced in response to calcitriol in the intestine help transport calcium across the intestine and into the bloodstream, greatly increasing the absorption of calcium from the diet. The vitamin D receptor is found in several cells that are critical for controlling the metabolism of calcium, phosphorus, and bone: intestinal cells, bone cells, kidney cells, and parathyroid gland cells. Vitamin D receptors also are present in most other tissues, including the brain, heart, skin, ovary and testicle, prostate gland, and breast, as well as the cells of the immune system, including white blood cells and other key immune cells.